Our Stamp Dealers are here to help You! Let our knowledgeable Stamp Dealers help you find what you are looking for! To go directly to a Stamp Dealer's website, just click on their logo. And please let them know you found them on StampNewsOnline.net. 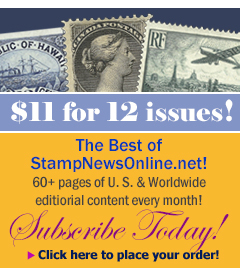 Stamps Dealers, advertise here for $33.00 a month with a direct link to your website and email. Or Advertise here and on www.StampNewsNow.com for just $49.00 a month. Phone free at (603) 424-7556 or send your email to ads@stampnewsnow.com. We invite you to join us online and browse our vast stock of quality U.S. essays, proofs, postal history, fancy cancels, and related philatelic literature. Buying online is easy. We accept Visa and MasterCard. You also may order by mail, phone, or e-mail. While visiting us online, you may view our quarterly newsletter and our most recent biweekly e-mail newsletter on new literature,additions to our stock, our stamp show schedule, and more. If you are considering selling all or part of your collection we provide an e-mail link to us. Palo Albums, Inc. "Home of Your Perfect Album"
Palo Albums, Inc. is the Official Representative of Palo, Lindner and Davo Products. The Palo line of albums includes every country in the world. Available in regular or hingeless form, color or black & white, you can probably find whatever you're seeking. Lindner quality stamp albums are unique for the fact that each hingeless page includes a plastic overlay sheet that you can flip to see the backs of the stamps. Davo offers affordable hingeless albums with post binders included. To explore our full lines, please click here to visit our website. Kelleher Auctions — Since 1885, the Kelleher firm has been a major source for the discriminating philatelic specialist. Now in our 127th year, we offer not one, but three outstanding public auction and internet sales venues: Daniel F. Kelleher Auctions, Dynasty Auctions, and Danbury Stamp Sales. Frank Bachenheimer — Specializing in U.S., Revenues, and Possessions. Shows. "Free Price Lists Available on Request. Specify Which Area." Dutch Country Auctions/The Stamp Center � Public Auctions; Buyers; Consignments; Appraisals; Retail Store; Bid Board; U.S. & Worldwide Stamps, Covers, Collections & large lots plus Numismatic Material, Deltiology, Americana, Autographs & Ephemera. Auction Catalog & Service Details Free. British Stamps America — We're Collectors Exchange/British Stamps America, and we invite you to enjoy "The Best of British"—covering the Stamps and Postal History of Great Britain and the British Family of Nations from the British Empire period right on up to recent issues—PLUS World Wide Topicals! * View the British Stamps America AD * Please let British Stamps American know you found them on StampNewsNow.com .